Choi Byong-hyon, a professor of English literature at Honam University in Gwangju, is widely regarded as one of the top translators of the Korean classics, especially historically important texts that are written in hard-to-decipher Chinese characters. Choi has already published four translated books in the category. The latest one, published in June by Harvard University, is a 1,056-page tome, “The Annals of King T’aejo: Founder of Korea’s Choson Dynasty.” He completed the massive translation project in just four years, a rare achievement in a field where there is a chronic dearth of professional translators with historical knowledge. The book covers the first 7-year reign of King Taejo, offering foreign readers a rare glimpse into a treasure trove of historical facts that shaped the lives of Koreans centuries ago. Choi’s translation of the King Taejo reign is part of the Annals of the Joseon Dynasty (“Joseon wangjo sillok” in Korean), which chronicles a 472-year-long history featuring 25 kings from King Taejo to King Cheoljong in 1,893 volumes. Choi’s involvement in the field traces back to 1997 when he was given a chance to teach both Korean and American literature to students at an American college. “When I was teaching American literature, there were many good texts available, but not so for Korean texts,” Choi said in an interview with The Korea Herald. Choi’s “great detour” ― translating and promoting Korean classics overseas after building his expertise in English literature ― gained momentum in that year, as he hit upon an idea after witnessing the so-called “IMF crisis,” Asia’s worst-ever financial crisis. At the time, Korean had to seek urgent help from foreign countries, a dire situation that reminded Choi of what the Joseon Kingdom went through due to the Japanese invasion in 1592. 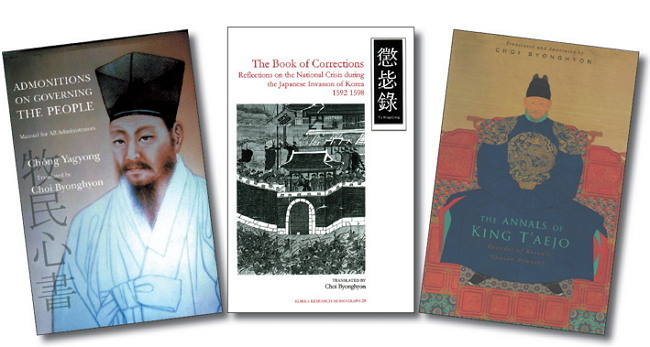 History repeats itself, and Choi jumped into the translation of “Book of Corrections: Reflections on the National Crisis during the Japanese Invasion of Korea.” Published in 2002 by University of California, Berkeley, the translated book is known here as “Jingbirok.” The author is Yu Song-nyong (1542-1607) who served as a chief state counselor and he vividly portrayed the major developments of the national crisis in 16th century Korea and described in detail what went wrong. Choi Byong-hyon, a professor of English literature, charts a new course in the translation of Korean classics. According to Choi, “Book of Corrections” provides an overview of the nation’s strengths and weaknesses during the national crisis, a universal message that can appeal to readers around the world regardless of historical backgrounds and nationalities. Choi finished translating the book in just one year, but he spent another three years working on detailed footnotes, mostly referring to historical facts in China and Japan as Korea’s history is closely intertwined with the two neighboring countries. After his first translation project garnered positive reviews and reactions, Choi decided to translate one of the major works of Chong Yak-yong (1762―1836, also known by his pen name Dasan). Chong, one of Korea’s most-esteemed scholars, spearheaded the advancement of practical studies known as ‘Silhak’ in Korean in 18th century Korea. Choi’s second translation was “Admonitions on Governing the People: Manual for All Administrators,” another tome of 1,176 pages that was published by University of California Press in 2010. The original text was written in 1821 as part of Chong’s endeavor to help overhaul the Joseon’s ruling system by providing examples of corrupt officials and tackling topics such as famine and social welfare. Due to the sheer volume and complexity, it took about 10 years for 15 scholars to complete the translation of the original text written in Chinese into Korean in 1980. Choi completed the English translation in about 10 years on his own: seven years to translate the texts and three years to add some 3,500 footnotes. He completed the final version in 2010. Choi clearly remembered finishing the first draft -- the 650,000 word translated text filling a large cardboard box. But he had to cut about 100,000 words to increase readability and better portray historical events in a concise manner. “He (Chong Yak-yong) should probably thank me,” Choi said. Choi’s third translation project was directed toward ancient maps. “The Artistry of Early Korean Cartography,” was published by University of Hawaii Press in 2009, as Choi accepted a request to publish a book on Korea’s geography features in English. The book features early Korean maps dating back to the Joseon dynasty, offering insights into cultural and historical data of pre-modern Korea. With four translation projects including the Annals of King Taejo under his belt, Choi is now working on his fifth project, “Bukhakui.” The original text, written by Bak Je-ga (1750-1805), describes his trip to China’s Qing Dynasty in 1778 and what he learned there. Choi plans to publish the English edition next year. Although Choi is a pioneer in the English translations of Korean classics, he still strives to improve the accuracy of his translations. For instance, finding the English word that accurately reflects the title of a government post during the Joseon period takes great effort and research time. When he feels that the translated word is not clear enough, he creates a new English term through what he calls “trans-creation,” a combination of translation and creation. Choi said that translation goes beyond the transfer of texts into a different language. The endeavor should reflect translator’s critical judgment, especially on how foreign readers respond to the translated texts. Asked about his future plans, Choi said he would like to become “a conductor of an orchestra,” as his retirement is approaching. “I’ve been a soloist so far. Now I’d like to form an orchestra, a team of talented translators, and work with them,” he said. 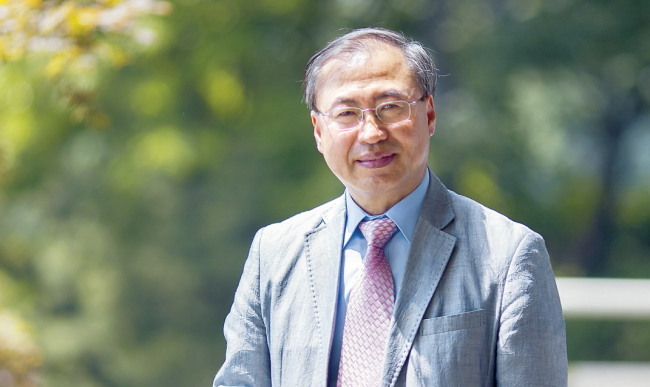 For such collaborative translation projects, Choi is working with a team of scholars and translators as a director of the Center for Korean Classics Translation, an academic unit established in Korea University. “Age does not matter. Even a 70-year-old translator can sit next to me and we can work to bring Korean classics to a status where other world literatures stand now,” Choi said.